there will be AT LEAST 15 FAMILIARS to win this year!!!! SCORING WILL BE AUTOMATED... that means we will only need a momentary pause at each DR to tally..
Top combined OVERALL score (regardless of station(s)) will Win a PLUM-COLORED LE OCTOPUS named Sugarplum!!!!! Top MALE pirate will win a Green /Tan PARROT FAMILIAR!! 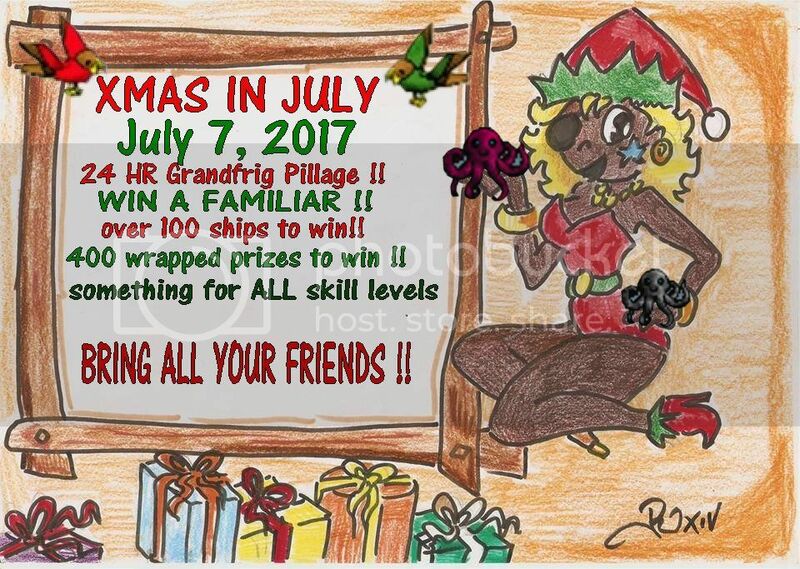 Top FEMALE pirate will win a Red /Tan PARROT FAMILIAR!! -Wine/white SPIDER FAMILIAR -named "Xmas Cheer"
-GREEN KRAKLING FAMILIAR named "Mistletoe"
There will be 400 wrapped presents this year!!! There will even be 4 "Portrait with Santa" prizes wrapped up!!! I will make a separate comment with a sneak peak at SOME of the wrapped prizes later!!! MARK UR CALENDARS NOW .. so u dont miss out !!! "you have won a complete outfit"
"you have won 10 dubs"
"you have won 25 dubs"
"you have won 25,000 poe"
"you have won 50,000 poe"
"you have won 250,000 poe"
"you have won 1 MILLION poe!" I am still in need of about 80 more prizes to wrap up!!! NO WORRIES... .the event WILL still be happening!!!!!! and THANK YOU to all the elves for helping with this chaos :) bad santa for not backing up those files...bad!! and HUNDREDS of other great prizes!!!!! 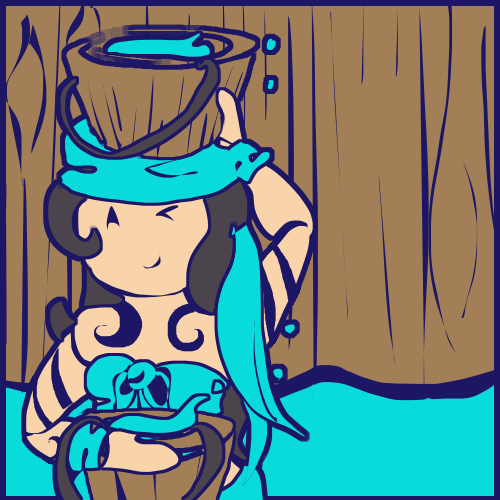 I stay up for about 4 days at a time, this octo is as good as mine :D sign me up. I should be able to pop on for some artsy fun. I'll mark my calendar this time so I don't forget! YAYYYY.... everyone LOVES all the great art you make during the event.... lots of fun!!! I've always said xmas should be in July anyway. 24 hours? Easy i'm in. YES YES.....we would be LOST without Adminelf!!! 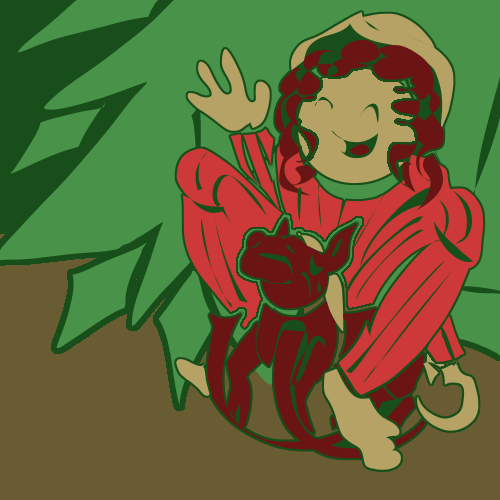 "Runkeerin rockin' around the christmas tree on her rocking pony!" I'm fairly certain those are not sized for adults. Poor pony. 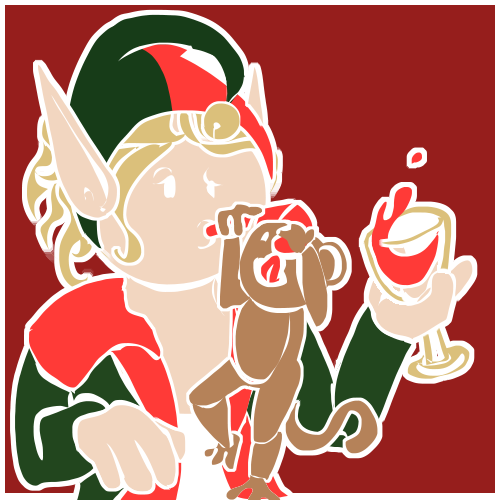 "Adminelf holding wine and eating a candy cane while being bothered by her monkey." "Pegasiswolf and Clotho swordfighting with candy canes." 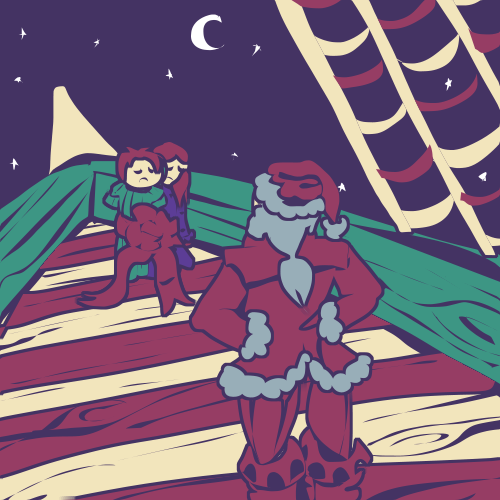 "Santa towing two kids back home who tried to shanghai his ship." 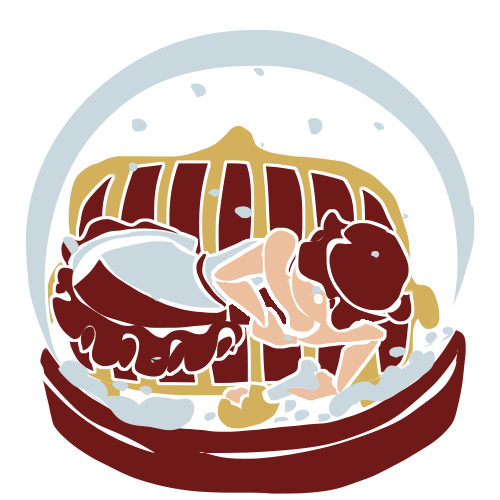 "Redeyeddevil in a turkey coma in a snow globe!" 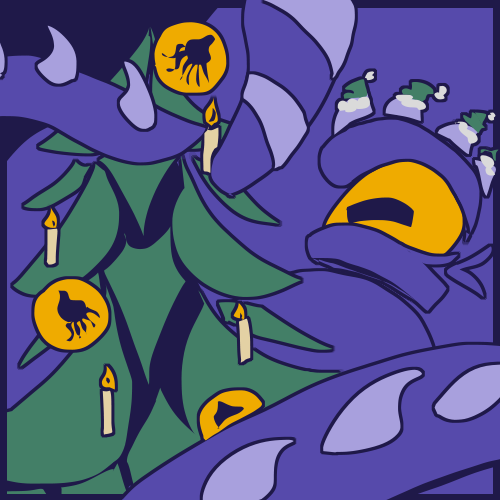 "A kraken decorating a Christmas tree!" 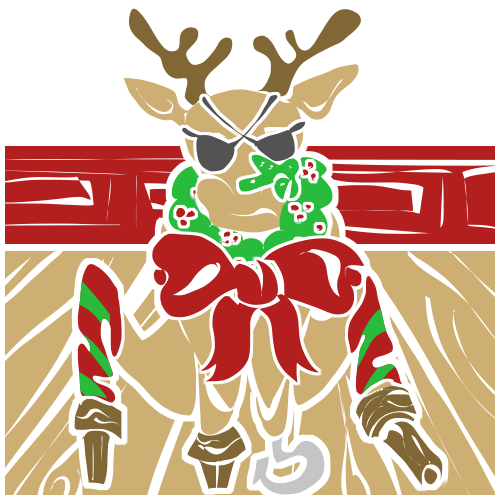 By popular demand: a reindeer with three peglegs, two eyepatches, a starfish, a hook, a wreathe and stockings. Queenisis being a pro at bilge! For anyone featured in a drawing, if you so choose, you can certainly resize to 150px and use as a forum avatar. I'd be flattered! 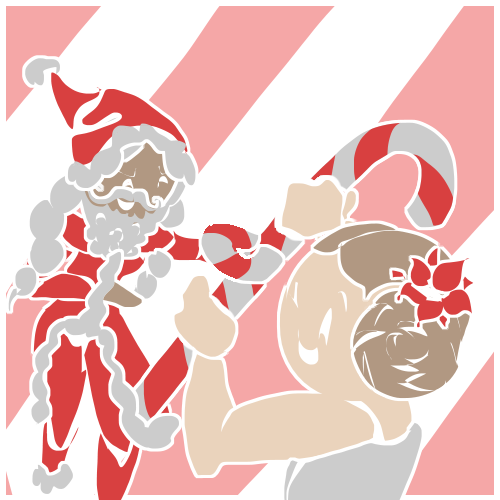 Thank ye for so much fun this year PegasiSanta and her elves! I had a blast!